Does the Daytona 500 Still Matter? Home / Beside the Rising Tide / Does the Daytona 500 Still Matter? Since its inaugural running in 1959, the Daytona 500 has always been circled in red on the annual NASCAR schedule. (Though it’s now the season opener, the 500 didn’t become the first points-paying race of the season until 1982.) From the 1960s onward, the Daytona 500 (the highest-paying race of the season), the Southern 500 (the oldest superspeedway race) and the World 600 (the longest race, now known as the Coca-Cola 600) have been considered the “Triple Crown” of stock car racing. In 1976, David Pearson swept all three races. When longtime NASCAR sponsor Winston instituted the “Winston Million” program from 1985-1997, that million dollar prize was awarded to any driver who could win three of four races: the three listed above and the Winston (naturally) 500 at Talladega. Bill Elliott became Million Dollar Bill by winning the Daytona 500, Winston 500, and Southern 500 in 1985. Jeff Gordon would become the only other driver to win the Winston Million in 1997, the last year of the promotion. That Daytona 500 win by Elliott in 1985 also marked the first time that the 500 itself paid out over one million dollars to the winner. Dale Earnhardt Jr. won 18 million dollars and change (OK, sacks full of change) for his 2014 Daytona 500 triumph. (NASCAR stopped publishing prize money figures for all races in 2016, but I figure winning this race still pays pretty well.) In addition to big checks, the notoriety and media attention that goes with a victory in this race also helps keep sponsors happy. They’re typically committed to writing big checks of their own to the Daytona championship team over the long haul. Beyond the financial windfall, he who pockets a Daytona 500 victory earns a coveted career statistic on any driver’s bubble gum card. Some notable Hall of Famers, perhaps most famously Mark Martin and Rusty Wallace, never managed a Daytona 500 win, though they were often right in the thick of it in the waning laps of the Great American Race. A valid argument can be made Martin should have won the 2007 Daytona 500 but NASCAR inexplicably let the race finish under green though there were cars upside down and on fire on the frontstretch. Like the recent Rams-Saints game in the NFL, you can argue about who should have won but the big checks still go to the winners on the scoreboard at the end of the contest. Other drivers, including Darrell Waltrip, Buddy Baker and Dale Earnhardt Sr. seemed to be plagued by a “Daytona Curse.” Each of them would only claim one Daytona 500: Baker in 1980, Waltrip in 1989 and, perhaps most memorably, Earnhardt the Original in 1998. Earnhardt would go on to perish in a last-lap crash during the 2001 running of the 500. So, as mentioned, winning the Daytona 500 presumably still pays pretty well and it’s hugely prestigious when added to a driver’s resume. That’s been the case since 1959 and presumably will be forever and ever, Amen. But in the modern era of NASCAR’s much-maligned playoff system, a Daytona 500 win offers another huge advantage. Though it’s the first points-paying race of the year, winning means that driver has all but locked himself into a playoff (or Chase, or whatever the heck we’re calling it this year) berth. Yes, Dillon wound up 13th in the standings largely due to a 39th-place result on the Roval-type thing at Charlotte and a 30th-place finish at Martinsville. Still, his sponsor was presumably well pleased with the amount of coverage Dillon and this sponsorship logo got late in the season. They were featured long after drivers like Ryan Newman and Jamie McMurray became all but invisible due to postseason misses. Presumably, Dillon’s car owner Richard Childress (who just happens to be his grandfather but the less said about that, the better) was pleased as well. Dillon is back in the same ride this year while McMurray is effectively retired. Newman lost his ride at RCR and has his one last, best chance at Roush this season. This year, winning at Daytona and clinching that playoff berth will be more important than ever. There’s a new rules package this year with new aerodynamic rules and restrictor plates at most of the superspeedways. Yes, I think I am supposed to refer to the new restrictive devices on the engines as “tapered spacers” this year. I’m using the old term on purpose this time but will likely do so inadvertently for at least the first half of the season. As I see it, the “tapered spacer” restricts the amount of fuel/air mixture reaching the intake manifold, lowering horsepower. If it walks like a duck, flies like a duck, quacks like a duck, and looks like a duck, more than likely it’s not a rhinoceros. The only real evidence we have as to how the new rules package will work is last year’s All-Star Race. There’s been some preseason testing and the results have been mixed. Resistance to any change is almost reflexive for a lot of people, me included. After the tests, some drivers were even-tempered and muted in their comments about the package but the majority of them seemed less than impressed. Speaking of which, Busch might have committed a doozy. NASCAR has signaled they won’t look too kindly on any discouraging words about their new Science Fair Project until a few months into the season at the earliest. It appeared they did not seem to appreciate Busch’s candor, mentioning something about how it might hurt him in the pocketbook. Officially, what they said was that if Busch felt that way about the new package cars (quick, someone come up with a catchy nickname for the new cars… the High Drag Queens?) and maintains he is a talented driver, he might just be telling sponsors and team owners his talents aren’t worth much. Unofficially, I get rather nervous when a sanctioning body like NASCAR predicts someone could very likely take a hit to their pocketbook. After all, they get to decide when to throw cautions, whose car is legal and who was speeding on pit road. Plus, they get to issue fines. Most of you can read between the lines there: NASCAR is in show business, not the sports business. And no emperor likes being told not only is he buck naked, he’s got a wee little winkie. Anyways, getting back to next weekend. Whichever team wins the Daytona 500 will have a decided advantage with that playoff berth all but sealed. They can experiment with the new package going forward, including some swings for the fences to get it figured out without having failure in those bold moves cost them their season. Meanwhile, other teams will have to play their cards closer to the chest, at least until they figure things out well enough to win a race, too. That makes the meaning of the Daytona 500 a mixed bag. Yes, the winner gets a spot in the Place-offys or whatever they are, but so does a win at New Hampshire or Texas. At the same time, it will be better for a driver and team to have added a notch to their belts early in the year rather than sweat things out as spring turns to summer to fall. You don’t want to finally find out why you’ve been blowing engines all year during the final week leading up to the playoffs. But let’s not get ahead of ourselves. Much of the nation, probably including where you live and certainly at my home, is currently enduring the winter from hell and sub-zero temperatures. It’s hard to grasp a single sporting event being held a week from now is going to seal a driver’s fortunes after a long (and hopefully) very hot summer as the leaves on the trees begin turning colors. For fans of restrictor plate races under the current rules (and I think I’ve heard from the dozen or so of you more than once) this year’s Daytona 500 will be the last hurrah for that plate and spoiler package. Carnage will almost certainly ensue and as long as everyone survives it, I will endure it if not enjoy it. Perhaps we’ll all be pleasantly surprised with racing under the new rules package after that. I suppose it could happen, but given the way fans have failed to embrace the playoffs, stage racing and the free-pass rule I’m not betting the ranch on that being the case. Next time you’re at the grocery store, take a slow stroll down the beverages aisle. You’re unlikely to see any “New Coke” on sale for a Daytona 500 party you’re unlikely to be hosting this year anyway. If your non-race fan friends are going to watch at least part of any race this season and ask you questions about it afterwards, it will be the Daytona 500. If any NASCAR winner is going to do the talk show circuit and perhaps have their mugs splashed on the cover of Sports Illustrated, it will be the driver who wins the Daytona 500. 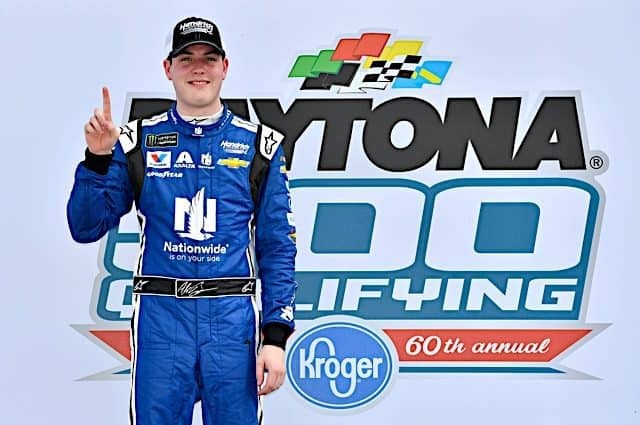 And even if there is no instant fix for what ails the sport an exciting race, memorable finish and bumped-up TV ratings at this year’s Daytona 500 would put a little wind beneath our wings as NASCAR tries to pull out of a tailspin. As it stands written in the Book of Bruce…. Glad to see you back for another NASCAR season Matt. I’ve been following you since the old SpeedFX and Racing One days. The chase has hurt the Daytona 500 expressly since they went to stupid winner take all race. Gonna start this season off right with McMatt, something I’ve neglected the last couple of years. Looking forward to the wit and the pot-stirring! So you’re back for another year of self-inflicted torture Matt (as am I). So glad to see that. My golden rule is that “I am against anything that increases the crapshoot factor in any aspect of any sport”. So by that credo you know how I feel about the tapered spacers which are, no matter what you want to call them, still restrictor plates. Is the Daytona 500 still important? Well, hell yeah! Is Indy 500 still important? If so, than so is the Daytona 500. Sure, both are somewhat arbitrary races that are part of a larger season but tradition and the money involved trump all else. A better question is, “Are the Twin 150 qualifying races still important”? The obvious answer is “no” and I doubt you’d get much debate from anyone that isn’t directly receiving revenue from that dog and pony show. Even if there were 50 teams showing up again, as long as 35 are locked in with Charters, the entire process is a Rube Goldberg waste of time and energy. Anyway, if nothing else, the 500 and start of the NASCAR season means that winter is on it’s way out, which is reason enough to make it important (unless you’re one of those sickos that like freezing weather, limited day light, and dealing with ice and snow). The Twins are solely just for setups and adjustments these days (those Charters! ughh), but I do get to see a race! This year a tad of drama with transfer spots up for grabs (we didn’t get to see that last season). 44 cars entered as of 2/8/19. I’ll take it! Drop the Rag!! Everyone have a great 2019 Nascar season!! Matt, welcome back from your winter “hibernation”, (or whatever you call it to paraphrase a certain racing journalist). I am really looking forward to your take on the new inspection and race results coupled penalties for 2019. If, as I have seen being “opined”, it’s at the urging of the new management, (imagine that term actually being reasonable accurate in NASCAR, LOL). Maybe “old” Jim France will be a breath of fresh air? Ch Ch Changes are a coming. About damn time too. I hope you are also watching, and will write about, the sale rumors concerning NASCAR. Maybe their bid to fully acquire ISC, (and take it private? ), is the precursor? Inquiring minds want to know. Looks like you are going to have lots of new and interesting occurrences to write about this year. I can’t wait. Totally unrelated but possibly of interest to you, have you ever been to Conyngham Brewing in Conyngham, Pa.? I hear from a fellow hot sauce aficionado that they have a killer jalapeno lager beer from time to time. Best wishes for a “feeling the wind in your teeth” year on your motorcycle. Last two days here in the Cracker State, temps have been in the upper 70s. Big cool-down today. Only supposed to see 50, but it’s sunny and bright. Tell me again why you stay in PA.